This blog entry is dedicated to Bell Brinn, who started the ride with us on March 8th, fell two hours into the ride on wet pavement, and went home to Colorado with a separated shoulder. She has rejoined us to celebrate at the Atlantic – great to see you! 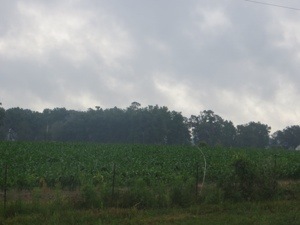 There was not much ‘excitement’ to the ride today: similar scenery to the last few days, cloudy skies, but no real rain. What few pictures I took all look as gray as the sky. 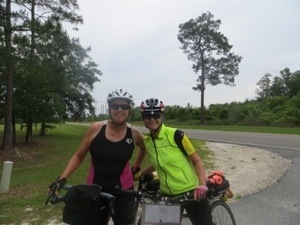 I do like this photo of Donna and me, biking buddies. We opted to wait for lunch until we got to Palatka, then enjoyed pizza slices at a local restaurant. 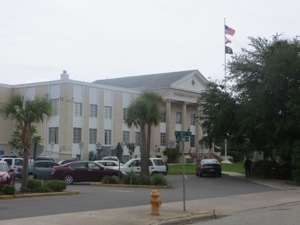 We did pass the county courthouse as we wandered in the historic downtown. 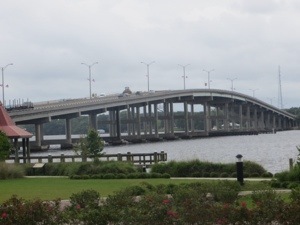 This bridge took us over the St. John’s River to our hotel, the Best Western of Palatka. 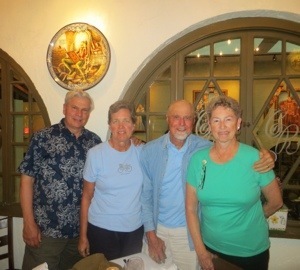 There I was met by husband Don and Florida friends and dedicated cheerleaders Ray and Linda Cannarella. 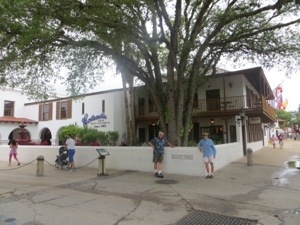 After we showered, we drove into St. Augustine for dinner at a favorite Spanish restaurant, Columbia. 75 miles today, average 12.1 mph. Gosh – I am so addicted to your blogs that I hate to see them end! You have added so much to my life and I KNOW you have added to many other lives also. You are a special lady. The end is in sight…how exciting for you….but I will miss reading your daily blogs. I have truly enjoyed ‘following’ along on this adventure. All the pictures have been wonderful!! Especially liked seeing Don and Ray & Linda in the one today 🙂 Tell them hello for us. We are so proud of you. Glad Don is with you and your friends. It’s been great following your trip! Whats’s next? Thanks Dolly!!!! Cheers to you for an amazing accomplishment….. I really enjoyed vicariously riding across country with your wonderful blog every day. Congratultions on completing what must have been a wonderful trip. Hope to see you back in Indiana on the bike. 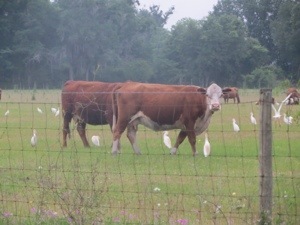 Dolly: I have followed your posts daily from the beginning and I am so impressed with your strength, determination, kindness, and artistic eye for cows and flowers. I have learned so much about the southern United States and the wonderful women with whom you traveled these past two and a half months. What will you do next, I wonder? Blessings and say Hi to Don for me! Congratulations, Dolly. Good job! Say HI to Don. Hope to see you and Don sometime this summer. Oh my, is it over ….so soon?! Congratulations on a “job” very well done!! You will just have to keep blogging since we have all become used to reading you every day…..that means you must continue having interesting rides to blog about! I look forward to meeting up in Seattle when you get here.